On 6/10/16, Adam Valenzuela-Orosco was last seen walking northbound on 59th Ave from Glendale Ave at approximately 1:17pm. Adam suffers from a traumatic brain injury sustained a few years ago and has short term memory loss. Adam does know his name and can communicate but has issues with simple task such as ordering food from a menu. Adam has left in the past and had asked strangers for a ride. 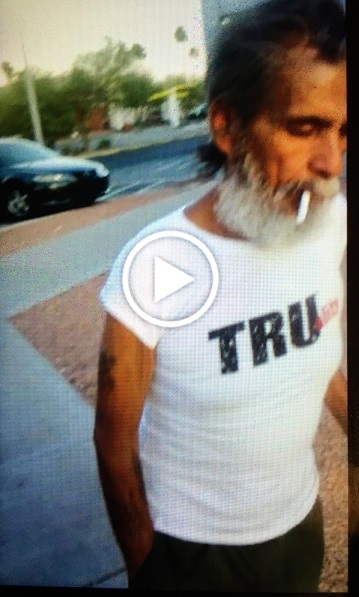 Adam is wearing the same white shirt in the attached picture with the letters, "TRU" on the front in black. The picture was taken two days ago. Last seen wearing white t-shirt with letters TRU on front in black, blue jean shorts and black shoes. Adam has a long gray beard and mustache.